Bletchley Ladies secured the Championship 2 Midlands crown for a second year in a row after a battling 38-10 win over Lichfield Ladies in the final game of the season. After the crushing 124-5 point win over Birmingham Moseley, Bletchley knew a bonus point win would put them out of reach of Buckingham, who started the day a point adrift. Conditions though were torrid at Manor Fields, but it was not long before they opened the scoring courtesy of a Caroline Collie try. Beth Metcalf then added a quick-fire double - both converted by Collie’s boot - to open the lead to 19-0. Lichfield got themselves on the scoresheet though, and reduced the arrears by five points thanks to their first try. Knowing they would need five tries to secure the bonus point, Clare Stacey then crashed over twice to increase the lead to 33-5 at the interval. 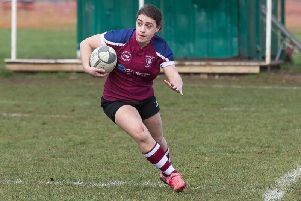 While hail battered the players at the start of the second half, Alex Sutton showed no signs of slowing down when she added another Bletchley try to extend the lead, while a late Lichfield try was mere consolation. After waiting to hear Buckingham’s result, Bletchley celebrated their second league title, but will have eyes on securing promotion. They take on Harrogate in the semi-final of the National Intermediate Cup this weekend.